Could North Korea Shoot Down U.S. Warplanes? Could North Korea make good its threat, delivered on Monday, to shoot down American warplanes near its coastline? “I don’t think it’s something that can be dismissed,” said Tom Karako, who runs the Missile Defense Project at the Center for Strategic and International Studies. North Korea's surface-to-air missiles include S-200s acquired from the Soviet Union in the 1980s. But it also has a newer missile, the KN-06, which is similar to newer, more modern Russian and Chinese weapons. Like the ICBMs being tested by North Korea, the KN-06 is mobile, so its location is not always known. “I don’t think any pilot would fail to take [air defenses] seriously,” Karako said. The S-200 air defense system “should be well-known to the U.S. as it was operated by Libya and Syria, as well as Poland and the Czech Republic — the latter two are now NATO members,” Byron Callan, an analyst with Capital Alpha Partners, wrote in a note to investors this week. 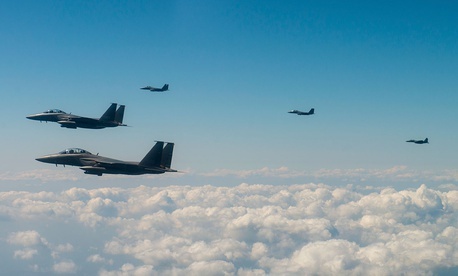 The U.S. B-1B bombers and F-15C Eagles that skirted North Korea’s cost in recent days are among the older jets in the American arsenal, more visible on air-defense radar than the newer, stealthier F-22 and F-35 fighters and B-2 bomber. Pyongyang also has aircraft. A 2015 Pentagon report says the North Korean air force has 1,300 combat aircraft, mostly Soviet-built. How would American planes stack up against these planes? “[T]hese are aged and would be no match for U.S. air superiority combat aircraft,” Callan wrote.